High flow Ultrapure Water (UPW) or “ultra high-purity water” is water that has been purified to the highest stringent specifications. Low flow ultrapure lab systems are also available here. Ultrapure water is a commonly used term in the semiconductor and pharmaceutical industry to emphasize that the water is treated to the highest levels of purity for organic and inorganic compounds, dissolved solids (TDS), particulate matter or suspended solids (TSS) whether it is volatile, non-volatile, reactive, inert, hydrophobic or hydrophilic. All dissolved gases must also be removed such as oxygen (02) and carbon dioxide (C02). Ultrapure water is also critical in food and beverage, dairy, healthcare, oil, gas and a variety of heavy industrial and commercial manufacturing applications and processes. Ultra Pure Water (UPW) systems have three primary stages: a pretreatment stage to produce purified water free of hardness, chlorine and organic matter, which is typically consists of water softeners, carbon filters and multilayer (ML or MID) filters. This is followed by a primary stage, typically a reverse osmosis (RO) system, to reduce the total dissolved solids (TDS) by 95% or more. 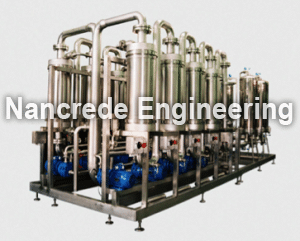 Lastly there is a polishing stage, which takes out the rest of the dissolved solids, gasses, TOC (Total Organic Carbon) and bacteria, organic and inorganic compounds. Auto Deionization (DI) systems, electro-deionization (EDI) or exchange tanks, ultraviolet lights (UV), .2 micron ultrafiltration and TOC system & oxygen, Liqui-Cel CO2 and gas membrane contractor system.